Ok moms, I have found an intriguing new website and some fun Father's Day crafting ideas for you and the kiddos. As a kid, I loved crafting with my mom. I remember the books of crafting ideas and the buckets of pipe-cleaners and glue and making my own cards for birthdays and holidays like the one coming up. 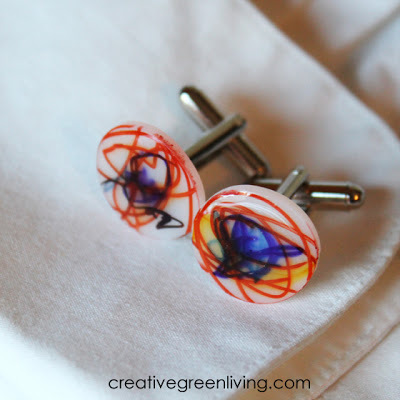 If I had kids I would totally make some memories and create these cuff-links pictured above. I might have to make some anyway. The cuff-link instructions are found here on a website I recently spotted. Creative Green Living seems to have some great stuff. You guys should check it out for sure. Another idea is to start a crafting Father's Day tradition. Of course at some point the cute cuddly kiddos will turn into teenagers and crafting might not be high on the list but until then.... Give the kids a sheet of thick drawing paper (maybe alternate 8 x 10/11 x 14 size pages between kids and years for diversity) and allow them to paint or draw something for Dad and then dedicate a wall in the house for these paintings to be collected and framed every year. So often kids craft and their creations piles up without a home...crafting with an end goal in mind would eliminate beautiful clutter that comes with those little bundles of love. We all know that Dad loves a good cookie every now and again and every kid loves an excuse to eat Pringles. 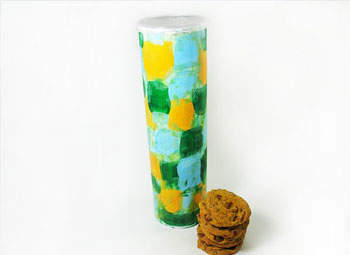 Re-purpose the can as a cookie tube just for Dad. You should also promise not to steal any while he isn't looking. Speaking of cookies...visit the Crisco site for my favorite chocolate chip cookie recipe. No, the cookies are not extremely healthy but you will certainly love how good they taste (moderation right?). If crafts aren't for you (they should be) check back in a few days for our Father's Day gift guide. And if nothing else, help you kiddos make a homemade card. Aside from the fun you will have I can guarantee you will save at least $5.